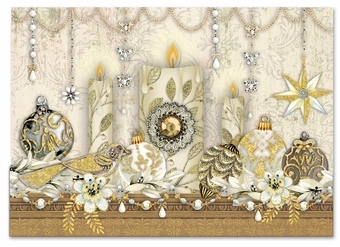 These gorgeous cards will bring an elegant touch to the holiday season! They feature candles and ornaments in shades of ivory and gold, with subtle black accents to contrast. Glitter and a gem at the center make them truly shimmer! Inside, the message reads, "May your Holidays Sparkle and Shine"!